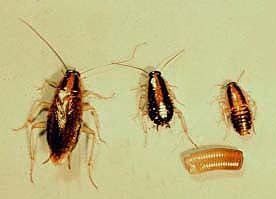 The cockroaches normally encountered by humans in his dwellings and food establishments are the German cockroach, Blattella germanica (L.), the American cockroach, Periplaneta americana (L.), and the Oriental cockroach, Blatta orientalis (L.). Each of these cockroaches undergoes a life cycle involving an egg capsule, a series of nymphs, and an adult. With the exception of the female Oriental cockroach, the adults of these three cockroaches have well-developed wings. However, they almost never fly; movement by both the adults and the wingless nymphs is by walking or rapid running. These three cockroaches can be distinguished by color and size. Adult German cockroaches are tan to medium brown in color and fairly small in size (10-15 mm). Adult American cockroaches are reddish brown in color and large in size (35-40 mm). Adult Oriental cockroaches are fairly large in size (26-30 mm) and are shiny, dark brown or black in color. The German cockroach commonly occurs in kitchens; the American cockroach appears more often in food establishments; and the Oriental cockroach is usually associated with dampness around sinks or in basements. Cockroaches are not normally encountered by man unless their populations become very large. Cockroaches will eat almost anything: left-over human food, wood, leather, cigarette butts, tooth paste, milk, sugary materials, coffee grinds, glue, soap, feces, fabric, shoes, paint, the glue on the back of wallpaper, human hair, fingernails, etc.